Jenny made these beautiful cupcakes for an event at Adrians… They truly were DELICIOUS, DECADENT, DIVINE, DELIGHTFUL…Mmmmm! 1. Preheat oven to 325°F. Place cupcake liners in cupcake pans (you’ll need approx. 36). 2. In a large bowl, whisk together cake mix, flour, sugar and salt. Add remaining ingredients and beat with hand mixer for 2 minutes, or until well blended. 3. Use ice cream scoop to fill prepared cupcake tins- fill about 3/4 full. Bake about 18 minutes, or until toothpick inserted in center comes out clean. *Recommend: Duncan Hines “Moist” White Cake mix for this recipe. 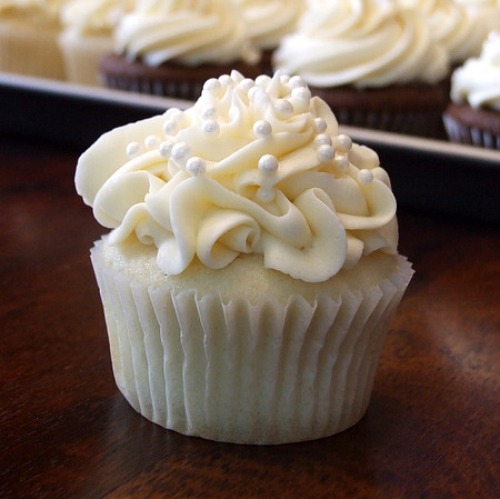 *You can use either regular or light sour cream for this recipe, but heck… since it’s a wedding cupcake and you want it to be as delicious and moist as possible, I recommend going for the full-fat kind. *Add 1 teaspoon of almond extract (in addition to the vanilla) if you wish to have a different flavor. *Using an ice cream scoop is perfect for getting the batter into the cupcake tins without spilling. *You can also use this mix to make cake. Pour into greased and floured cake pans. Bake until toothpick inserted in center comes out clean. This is my go-to recipe for icing basic cupcakes and wedding cake. It’s so easy to make, and it works through a piping bag well. 1. In a large bowl, with a hand or stand mixer, cream together sugar and butter on low speed. Mix until well blended. Increase speed to medium and beat for another 3 minutes. 2. Add vanilla and cream and continue to beat on medium speed for 1 minute more, adding more cream if needed for desired spreading/piping consistency. 3. Scoop into a piping bag and pipe decoratively onto cupcakes, or spread onto cupcakes as desired. *This recipe doubles or triples well. *There is no need to sift the powdered sugar, unless you’re worried that your sugar is quite lumpy. *Do not try to replace the butter with margarine or shortening- it won’t work out well. *Add in color, if desired. I like to use colored gel paste instead of liquid food coloring- then you’re not messing with adding additional liquid to the perfect consistency of the frosting. Gel paste is sold at craft stores and baking supply shops. *For the cupcakes in the photograph above, I used a 1G Tip by Bakery Crafts to pipe the frosting.